Hot ball probe (Ø 3 mm) for flow and temperature | Tepelně | Rychlost proudění vzduchu | Parametr | Testo, s.r.o. Use the hot ball probe (thermal anemometer) to determine flow velocity and volume flow in ventilation ducts or at air outlets. For measurement at air outlets, we recommend that you use the hot ball probe in conjunction with the testo 445 measuring instrument and the testovent 410 or testovent 415 measurement funnel (all available to order in addition to the probe). The probe is particularly suitable for low flow velocities of up to +10 m/s – and also for non-directional flow measurement. The probe can also measure temperatures of up to +70 °C at the same time. The hot ball probe is equipped with a telescope, which can be extended to a maximum length of 850 mm. 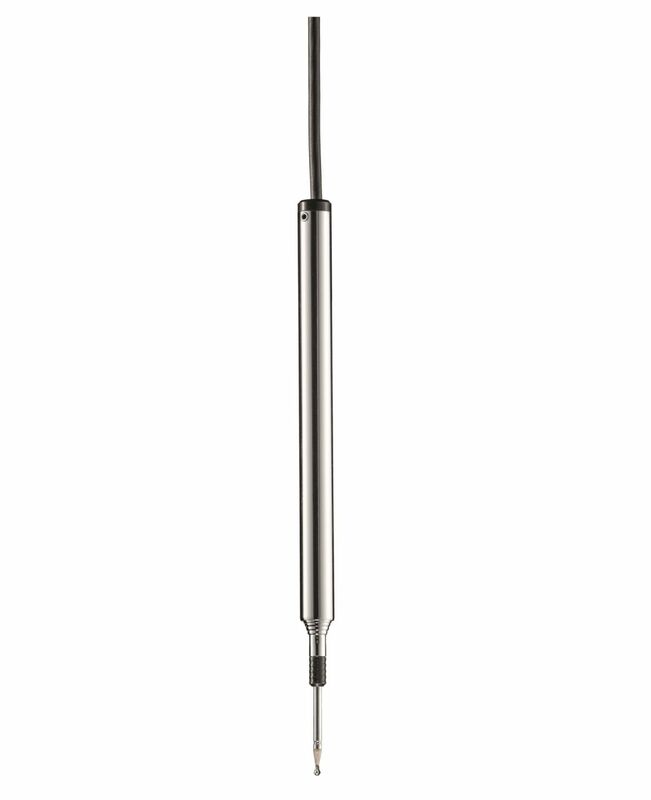 With a diameter of just 3 mm, the probe is ideal for measurements in narrow, inaccessible places. Hot ball probe (Ø 3 mm) with telescope (can be extended to 850 mm) including handle.